Firstly you will need to decide how many chocolates you want on each skewer  and then carefully push the skewer through the centre of each chocolate. When you have skewered all the chocolates place them into the freezer for a while to chill down. Whilst the chocolates are chilling you can make the batter by placing the flour, salt, sugar, baking powder and cocoa into a bowl. Crack in the egg and add the milk and whisk together to form a thick batter. Add in the chopped nuts and gently stir through. 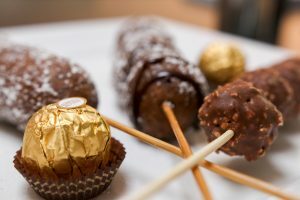 Remove the chocolates from the freezer and use a spoon to spoon the batter over and around the skewered balls, making sure you get into all the little cracks. 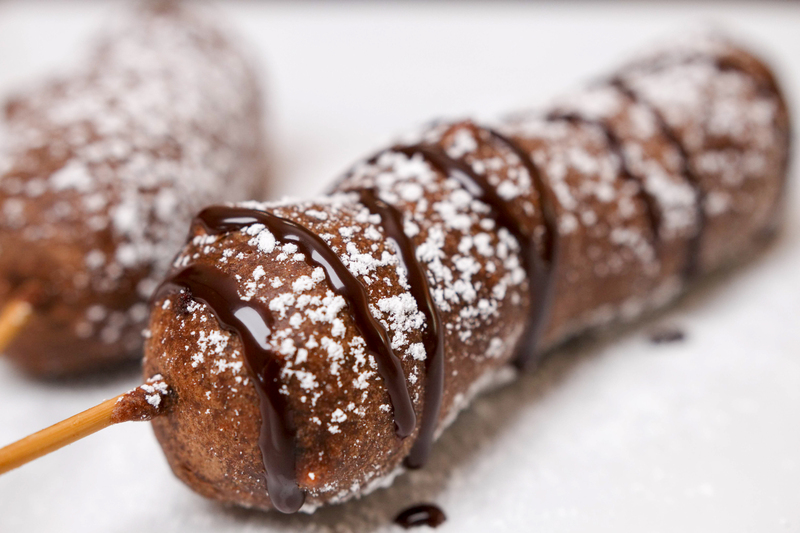 Twist and gently shake the batter over the chocolate and then carefully lower into the hot oil. Turn the skewer as you lower it into the oil as this helps to get an even coating. Cook for around 3 minutes , turning if necessary but the skewers should turn themselves. Remove from the hot fat when golden brown and place onto kitchen paper to drain. 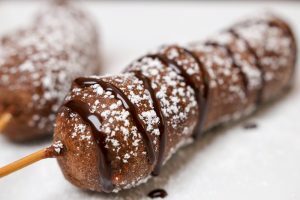 Dust with powdered sugar and drizzle with chocolate to serve. Enjoy!